A Factoid is a Brief Piece Information that Appears True - Fact or Myth? A factoid is a piece of information that appears to be true. A Factoid is a brief piece of information that appears to be true, but isn’t necessarily factual or verified, yet is typically repeated as fact anyway. In other words, a factoid is a claim of any type, true or false, that is communicated as if it were a fact, yet can’t be verified as a fact without more information. Consider, a fact is something that is necessarily the case, but a factoid is something presented as a fact, but could be a fact, myth, half-truth, or opinion. This is to say, a factoid is a proposition that is being presented as being real information with a clear truth-value, yet it is generally not presented along side a conclusive logical argument, proof, or citation (and are therefore is unverified as true when presented; at least to the recipient of the information). Broadly speaking then, a factoid is any bit of information (an idea, a theory, a hypothesis, a collection of ideas, etc.) presented in a way that 1. assumes it has a certain truth value, but 2. can’t be confirmed as truth, half-truth, or falsehood without more information. We don’t know if a given factoid is true information or counterfeit information, and we don’t know if it is misinformation, disinformation, propaganda, or pure information, we don’t know if the conveyer of the factoid has framed it exactly right, all we know is that it was presented as a useful truth. It is that second definition (the one that says, let us look closer, not let us dismiss this is myth) that in my opinion speaks to the memes, talking points, headlines, and social media comments that permeate our real everyday lives here in the modern information age. With the above in mind, the term factoid most of all describes a real phenomena that we all know from watching prime time news and using the internet to communicate. These are the brief bits of information we hear on the news or see on the cover of the rag at the checkout counter at the grocery story and then repeat in some butchered state. They are bits of information, unverified, often meant to convey exciting gists rather than pure information. What a fact is to science, a factoid is to advertising and water-cooler talk. If it sounds true, but can’t be confirmed as true as presented, it is a factoid…. and technically, what I just said is a factoid about factoids. Thus, a factoid can be BS, or not. It can be a truth, half-truth, or lie. It can be a common belief, an urban legend, a statistic, a quote, a well intentioned misquote, a manipulative talking point, or any other tidbit of information. If there is no verification for the claim, then the statement is a factoid, regardless of if it is true or not. The rest is a matter of semantics, as sometimes today we use factoid to mean “a neat little ‘did-you-know‘” like “did you know neither hundred years’ war was 100 years long?“. On this page we cover the history of the term factoid, discuss some of the ways it is used in every day life, and then describe the different ways we use it for our own fact-checking website FactMyth.com. A media headline may confuse us, but formal logic and reason do much to clarify the world for us. The Principle of bivalence says, “every declarative sentence expressing a proposition (of a theory under inspection) has exactly one truth value, either true or false.” In other words, every statement structured properly has a definite binary truth-value (two-value True or False logic). Yet, constructivism (in the philosophy of mathematics) shows us that, even though everything is either true or false, there are some things we don’t know. So we have to consider 3-value logic: True, False, and Unknown. Here we can say plainly that a factoid, under our definition, is “pressing a proposition (of a theory under inspection)”… and thus, we can apply 3-value logic. Either the statement is: True, False, and Unknown. On our site we like to deal with True or False (Fact or Myth) two-value logic. So in the case where we can’t denote a factoid as fact or myth, we rephrase the factoid into a form that we can apply two-value logic to. With this, we take the talking-points, strip them of their opinion form, and force them to comply with the rulesets of formal logic. 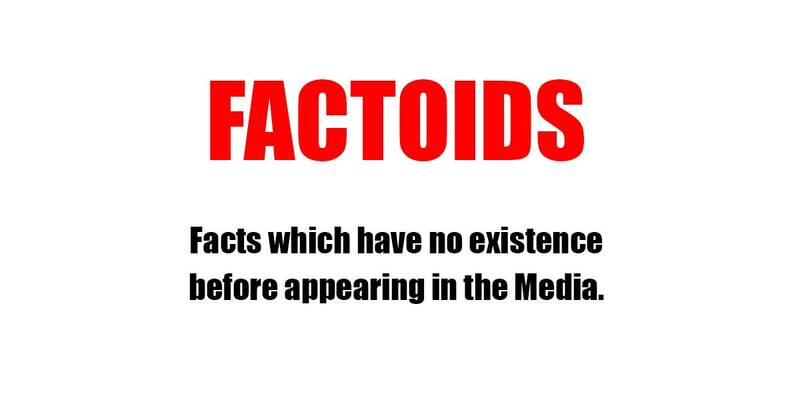 So what is a factoid really? It is an informal proposition that puts forth an unverified claim. Still, it is a proposition and thus it can be looked at through the lens of formal logic (and thus it can be stripped of its sensationalism and made “positive” with a little work). Some assert that a factoid describes information that seems factual, but isn’t. Some offer definitions that consider truth secondary (implying that a factoid can be true, or not). Some use the term to describe tabloid fluff (facts which have no existence before appearing in a magazine or newspaper), some any fact, myth, or urban legend, and some use it to describe little snippets of information that are “fun and true”. The list goes on. Some of the above are probably better definitions than others, but that said, this new addition to the lexicon likely escapes ridged definition due to its elusive and modern creation. An example of a factoid. This sentence originates here and is unverified. That is what makes it a factoid! The term factoid was coined by Norman Mailer in his 1973 biography of Marilyn Monroe. Mailer said factoids were, “facts which have no existence before appearing in a magazine or newspaper“. If you just believe the above quote, you are… believing a “factoid” passed around the internet. Seriously, Google “facts which have no existence before appearing in a magazine or newspaper”. A quick glance confirms this quote is simply repeated over and over without additional fact-checking or verification! If you were to go around repeating that above claim, you would be spreading an unverified talking point, “a factoid”. To verify the claim, we have to at least break out a copy of Marilyn: A Biography and verify a page number for our audience. Looking through a Google Books copy of Marilyn, I find lots of mentions of “factoid”, but not the aforementioned line. Time for more research. I couldn’t verify that quote either, although it seems Merriam-webster.com backs this up. So we have TIME and a dictionary, that is a little more solid than “random internet sites”. Lets keep digging. The 1983 book Silverless Mirrors: Book, Self & Postmodern American Fiction, does a great job cluing me into Philip Stevick’s concept of a “mock-fact” and presents the quote TIME gave me in full. The author Charles Caramello has done some great research, we now know this “factoid” is at least from the 80’s. Finally, i’ve found the passage! It is on page 18, Mailer says he is coining a term and then defines “factoid”, which he continues to use throughout his book. Through example, Mailer gives a number of clear definitions of exactly what he means when he says factoid. Great! We no longer have to just fish around in the dark based on re-quotes. Of course, this doesn’t prove Mailer coined the term, nor is it the final word on its use, but it does verify the above claims for our audience (for what may be the first time since this was written about in 1973). Now that we have some basis for our claim that “a factoid is a brief piece of information that appears true”, we can move on to our definitions of the term here in 2016. TIP: Notice how we fact-checked a widely believed claim to verify it. That is what our website does. This is the effort and logic we put into every page here. Factoids are bits of information that appear true. They can be commonly held beliefs, maxims, axioms, folk lore, “he said, she saids”, the headlines of the day, logical conclusions to data, misconceptions of data, pseudo science, or bits of information passed around by any form of communication. If it sounds true, but hasn’t been fact-checked, it’s a factoid (even if others have proved it true, it’s a factoid to you). FactMyth.com uses the word “factoid” to mean any argument that sounds true that can be fact-checked to be confirmed as a fact or myth using citations. Learn more about FactMyth.com. 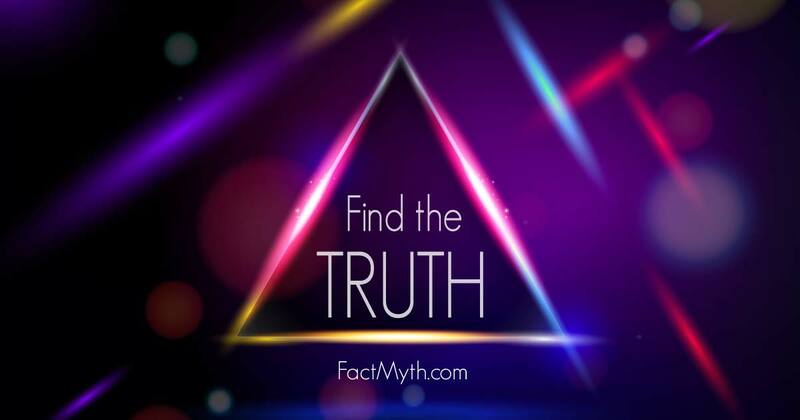 See our Facts section and Myths section for lists of all factoids researched by FactMyth.com. Fact-checking factoids is what we do. TIP: Factoids also include age old myths like the idea that crossing your eyes can make you go cross eyed. Sometimes a factoid can be a statistical claim, rather than a general bit of information. One factoid, for example, may say 1 in 2 people in Switzerland own a gun, while another factoid may say 47.5% of Swiss people own a gun. Instead of taking each of these factoids at face value, we can break them all down to a commonly held belief that “Gun Ownership is Relatively High in Switzerland” or “all Swiss own guns“. A fact is something that is proved to be undoubtedly true. A myth is something that is proved to be undoubtedly untrue. A factoid is something that appears true but is unverified. TIP: A factoid can be a fact, a half-truth, or a myth. The factoid is always true or not true, but it can’t be properly labeled a fact or a myth until all parts of the statement have been proved true or untrue. Learn more about the nature of truth. A factoid is a piece of information that appears true. It may be proven to be a fact, a myth, or a half-truth using data, logic, and critical thinking. Since half-truths are not undoubtedly true they are better categorized as myths than facts. “Factoid“. Oxforddictionaries.com. Retrieved Sept 30, 2015. “THE DIFFERENCE BETWEEN A FACT AND A FACTOID“. Todayifoundout.com. Retrieved Sept 30, 2015. “FACTOIDS“. Greebag.org. Retrieved Sept 30, 2015.